← Atheist Soldiers Want a Chaplain? Today is the feast day of St. Catherine, but since we are still in the octave of Easter, the Church does not celebrate her day. St. Catherine is the other woman in my deacon husbands life. But that is fine with me. I have another man in my life—St. Augustine. 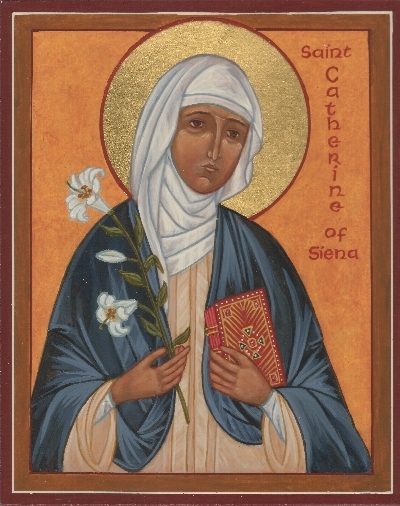 A few years ago my favorite deacon mentioned, to another deacon’s wife, that St. Catherine was his favorite saint. She said, while giving me a look that could melt an ice berg, “you must like strong tough women”. It was clearly not meant as a compliment. It is a good thing that she didn’t know me when I was young and still ate barbed wire for breakfast. Anyway here is St. Catherine’s story. Source The Catholic News Agency. “St. Catherine was a third-order Dominican, peacemaker and counselor to the Pope. She singlehandedly ended the Avignon exile of the successors of Peter in the 14th century. She is the co-patron of Italy and of Europe. Born in Siena, on the feast of the Annunciation, March 25, 1347, Catherine was the 23rd of Jacopo and Lapa Benincasa’s 25 children. Her twin sister died in infancy. She exhibited an unusually independent character as a child and an exceptionally intense prayer life. When she was seven years old she had the first of her mystical visions, in which she saw Jesus surrounded by saints and seated in glory. In the same year she vowed to consecrate her virginity to Christ. When, at the age of 16, her parents decided that she should marry, she cut off her hair to make herself less appealing, and her father, realizing that he couldn’t contend with her resolve, let her have her way. St. Catherine suffered many intense periods of desolation alongside her mystical ecstasies, often feeling totally abandoned by God. She ended her solitude at this point and began tending to the sick, poor, marginalized, especially lepers. As her reputation for holiness and remarkable personality became known throughout Siena, she attracted a band of disciples, two of whom became her confessors and biographers, and together they served Christ in the poor with even greater ardor. The Lord called her to a more public life while she was still in her 20s, and she established correspondences with many influential figures, advising and admonishing them and exhorting them to holiness, including the Pope himself who she never hesitated to rebuke when she saw fit. Great political acts which are attributed to her include achieving peace between the Holy See and Florence who were at war, to convince the Pope to return from his Avignon exile, which he did in 1376, and to heal the great schism between the followers of the legitimate Pope, Urban VI, and those who opposed him in 1380. She achieved this while on her deathbed. Her Dialogues, one of the classics of Italian literature, are the record of her mystical visions which she dictated in a state of mystical ecstasy. In 1375, while visiting Pisa, she received the stigmata, even though they never appeared on her body during her lifetime, owing to her request to God. They appeared only on her incorruptible body after her death.